We heard that the first Verizon Windows Phone 7 device would launch in March and now we see an HTC Trophy spotted donning the familiar Verizon branding. This is certainly a good sign for that March release. The device is said to be spec-exact to the European version of the HTC Trophy, save for the branding. It also features the March update that of course includes copy & paste along with support for CDMA networks. Hi all, new guy here. Can anybody tell me if this phone is worth getting? I’ve read some reviews online which seem to indicate that it’s a low-mid spectrum WP7 comparatively. My concern is the 8gb internal memory…I plan to use the Xbox Live features of this phone extensively, but I don’t want to run out of space quickly. Should I go ahead and get this phone, or is there a new WP7 coming out on Verizon within the next few months that I should look into? I haven’t seen any rumors or solid information on other Verizon phones with WP7. 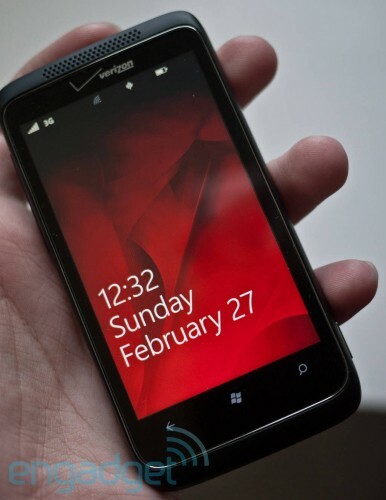 If I were to wager a guess, I’d say the next big Verizon WP7 handset would come in the fall. Microsoft is scheduled to drop their next big software update in the fall. Additionally, the fall is typically a time when new phones are released, in time for holiday shoppers. Thanks for the info. I’m not worried about getting a “top of the line” phone as I’ve heard the WP7 OS runs well on all the phones. It’s the non-upgradeable memory that concerns me. Can anyone give me an indication of how large the file size is for XBL games in general? After you purchase an app, does it stay linked to your account forever (meaning: can I delete and reinstall later should I run out of space)? Also, the VZW is slated to have 16 gig of memory and not the 8 gig in the European version. Personally I think it is the apps that make the phone and tip the value proposition. Sure the AMOLED screen are gorgeous, but that isn’t the biggest deal in the world in my book. I’ve handled on the VZW Trophy phones in person at a VZW store on Microsoft campus and it is a decently solid device and the screen is very respectable. The OS is the same across all the phones and the hardware, IMHO, is only marginally responsible for differentiation. It’s in the apps so as the store grows everyone can customize, so to speak, their phones as they see fit while also being able to get updates as they are made available…understand the whole Microsoft/Service Provider/OEM ecosystem. Anyone have any experience using the new version of Outlook BCM on a new Windows phone. I rely on it on an old Moto-Q and Vista laptop running Office 2007. The BCM file on my moto-Q is so large it creates all kind of problems. Been holding out for new windows phone from Verizon but can’t wait much longer. Going to get new laptop with Office 2010 at the same time. BCM gobbles memory on the laptop as well.